A judge at the Ofer Military Court ruled yesterday that Palestinian protest organizer, Bassem Tamimi, will remain in prison indefinitely, until the end of his trial. The judge denied a motion filed by Tamimi’s defense lawyer, adv. Labib Habib, to revisit a prior decision to hold Tamimi until the end of legal proceedings. The motion to release Tamimi was filed nearly seven months after his arrest, and while only one witness was heard by the court in his case during that period. The defense argued that with the trial being conducted at such a slow pace, Tamimi will not receive a fair trial or a chance to fight for his innocence. With only one of 24 prosecution witnesses heard in seven months, the duration Tamimi’s trial is expected to exceed the anticipated sentence, even in case Tamimi will be convicted by the court. The defense also pointed out the fact that three hearings were canceled so far at the fault of the prosecution, including one to which their witnesses did not show up and another to which the wrong witnesses were summoned by the prosecutor. Tamimi’s lawyer also argued that the one testimony that was heard (click here for a summery of the hearing), that on a military commander who was in charge of dealing with the Nabi Saleh demonstrations, was based on hearsay and speculation. 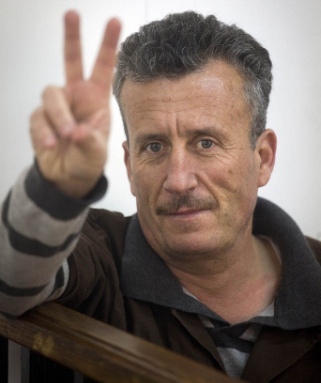 The judge, however, decided to deny Tamimi’s motion, and ordered him to remain in custody. In his ruling, the judge determined that not enough time has passed and that the motion was premature, despite the delays in the trials. The judge also noted that since Tamimi’s alleged accomplice, Naji Tamimi, was sentenced to 12 months imprisonment, a reasonable time to file a motion to revisit Tamimi’s remand decision will only be a year after his arrest. Some 80 protesters in Nabi Saleh’s weekly demonstration honor the village’s political prisoners and attempt to reach the confiscated spring. The weekly protest in Nabi Saleh, north of Ramallah, was held in honor of three local political prisoners who are planned to be released following the prisoner exchange deal achieved last week. In addition to celebrating the forthcoming release, the demonstration also marched pass the house of another local prisoner who will remain in prison, and promised to continue the struggle until all political prisoners are free. After marching inside the villages, the demonstrators made an attempt to reach the village’s spring, which has been taken over by the adjacent settlement Halamish. However, as soon as the demonstration started heading towards the lands the army met it with great force, instantly shooting large amounts of tear-gas and rubber bullets at the demonstrators. Three protesters were slightly injured.